It looks like it's been photoshopped - or a psychedelic painting. But this American hot spring is as real as they come. At 370-feet in diameter, 'Grand Prismatic' is the largest hot spring in Wyoming's Yellowstone National Park, and the third-largest on earth. Yellowstone is renowned for its geysers - the main reason the park was first established in 1872 - but this rainbow-like spring is even more dramatic. Sitting on a mound from which water flows evenly on all sides, forming a series of step-like terraces, it was named in 1871 for its bizarre and beautiful colours. 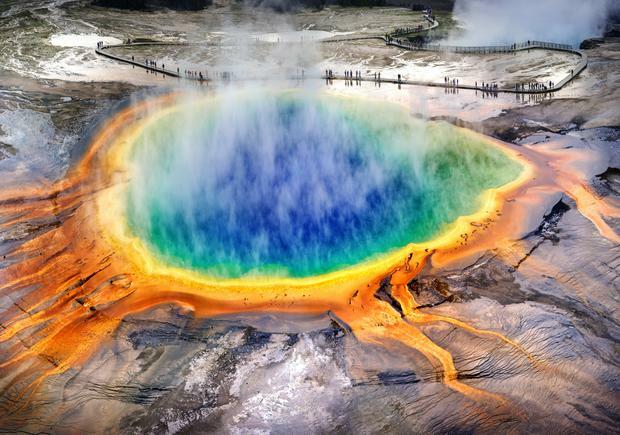 "Nothing ever conceived by human art could equal the peculiar vividness and delicacy of color of these remarkable prismatic springs," said Ferdinand Hayden, whose 19th century expedition first described Grand Prismatic. Rudyard Kipling referred to it as "Hell's Half Acre." So how does the spring get its extraordinary colours? The answer lies with the different types of bacteria that live within the concentric rings radiating out from the centre. Grand Prismatic ranges from 87 degrees at its core to around 67 degrees at its outer edges - temperatures too hot to sustain most life, but not certain bacteria. As the temperatures change, so do the bacteria. The outermost ring is the coolest, and home to the most diverse range of bacteria. The mix produces the darkest colour - a captivating red-brown. See yellowstonenationalpark.com or nps.gov for more.